When you are looking for the perfect piece to compliment your interior space and décor, we suggest that you pick an artist whose work you admire and commission work from them directly. By doing so you support the artist and their style as well as ensure that your piece will be unique and bespoke to your particular needs and taste. One should remember that each artist has their own unique style, thus when ordering your custom piece please don’t look to replicate other artists style or work. An artist with integrity, will never copy another one’s art and will turn down the commission. 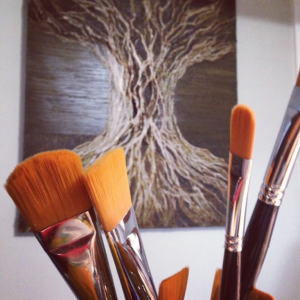 We suggest you consider two ways of starting your journey with commission art. The first, is to consider the artists current collection of paintings and using them as inspiration. The second, is to grant your artist complete creative freedom. Regardless which route you choose, bear in mind that the artist will turn to you for some direction in order to ensure you are truly satisfied with the final product. What size of painting will fill my needs and the needs of the space? Do I have a color palette that I would like the artist to use? Will I want my painting framed or am I fine with raw canvas? What timeframe do I have for this project? Will I be moving or redesigning my interior in near future? While there are many more questions your artist will ask you before starting their work these general 5 questions are a great starting point in the process. Remember the more insight you provide as to your vision for the artist the closer they can come to delivering such a product. Commissioned work is started upon receiving 50% deposit and signing an agreement. If artist has questions or sees any potential problems with the commissioned work, it will be discussed prior to signing a contract. Artist prepares 3 miniature sketches of possible final piece. Out of those client picks a favorite to go ahead with. Once the full size painting is completed, client will see a photo of art for approval. Simple tweaks and minor changes are welcome, but any major changes during the final painting process will result in additional costs and extended wait. Once the painting is approved, client needs to pay remaining 50% of final price, do before pick up or delivery. Paintings are typically finished in a 3-9 week lead time, depending on size, detail, as well as feedback and guidance from the client. All of our pieces are packaged in custom built boxes to protect them during the shipping process. All painting arrive ready to be displayed, along with signatures from the artist to showcase authenticity. If you are ready to start, please fill the form below. It is very helpful if you provide your artist with photos of the interior space or the particular room where the art will be displayed. Additionally, you can bring in samples of materials, textures, colors and any stylistic details that pertain to the room which it will be showcased in. You may mail the artist samples or email photos of them. If relying on emailed photography, please bear in mind that technology is not perfect and that colors are affected by cameras, monitors and displays so exact matches are not always possible.